Ananya Pandey Wraps the First Schedule of Pati Patni Aur Woh! 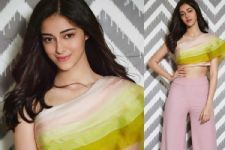 The newest member of Bollywood Ananya Panday who is gearing up for her debut with Student Of The Year 2 alongside Tiger Shroff and Tara Sutaria and has already bagged her second film 'Pati Patni Aur Woh'. The actress had started shooting for her second film even before the release of the first film and finished the first shoot schedule for the same. Ananya's Pati Patni Aur Woh co-star called her that "Happiest Person on the set" as he shared her videos post the wrap of the schedule. The young actress is all smile as she finished the shoot and was chilling with the crew giving us happy vibes. Earlier, Ananya shared pictures posing with her team. The actress was seen soaring the temperature in an off shoulder side slit dress leaving the audience excited for the episode. The actress is one of the most talked about celebrity on social media and has been creating a storm with her spottings even before her Bollywood debut. Fans across quarters are extremely excited to witness the actress on the big screen. i thought that bollywood was exploiting young girls and forcing them to work in movies and now, she is just 19 and already shot 2 movies. already a star. why people made a fuss of Alia then? these days all these star kids are coming at such a young age.